There’s a shockingly common misconception about insider trading out there, and it’s keeping investors from taking advantage of a powerful moneymaking tool. Contrary to popular belief, it is perfectly legal for corporate insiders to trade shares of their own companies. In fact, it happens all the time. The insiders just have to publicly disclose their transactions to keep everything aboveboard. People can be forgiven for getting confused about this issue. Insider trading is a crime, but it’s not quite what it says on the label. If you’re a corporate executive (or you’re friends with one) and you get your hands on, say, a not-yet-released earnings report, you could use it to make a bunch of money by secretly buying (or short-selling) shares of that corporation before the report is released. Corporate insiders can legally trade shares of their own companies — and they can even get away with using insider information — as long as they report the transaction to the Securities and Exchange Commission (SEC) with a Form 4 within two days. The SEC then uploads that Form 4 to its Electronic Data Gathering, Analysis and Retrieval (EDGAR) system, a public and searchable online database. Thanks to EDGAR, all investors have equal access to trading information from corporate insiders, and no one has an unfair advantage. As I explained in the section above, the difference between legal and illegal insider trading really comes down to disclosure. Corporate executives inevitably do incorporate sensitive insider information into their personal trading decisions. The government knows it would be impossible to ban this practice outright. Prosecutors would have an extremely hard time proving that a specific transaction was motivated by a specific piece of insider information. So instead, they just require executives to make their insider transactions publicly visible on the internet no more than 48 hours after closing. This levels the playing field a bit by tipping off other investors (at least those who can navigate EDGAR) and reducing the executives’ first-mover advantages. 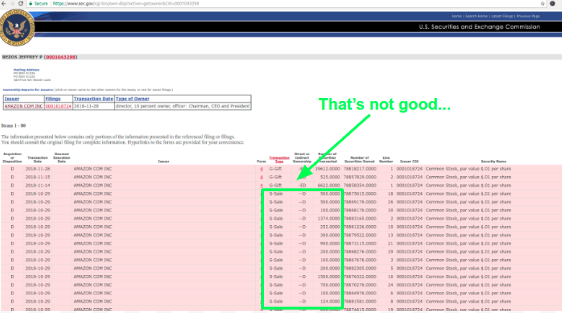 But here’s the thing: EDGAR is so user-unfriendly that most investors don’t bother learning how to use it. If you do learn how to use it, then you’ll be part of a select group of investors who can track the insider trades of a company’s executives in (almost) real-time. You’ll effectively have that first-mover advantage that EDGAR was supposed to eliminate. And this can be an incredibly powerful due diligence tool. 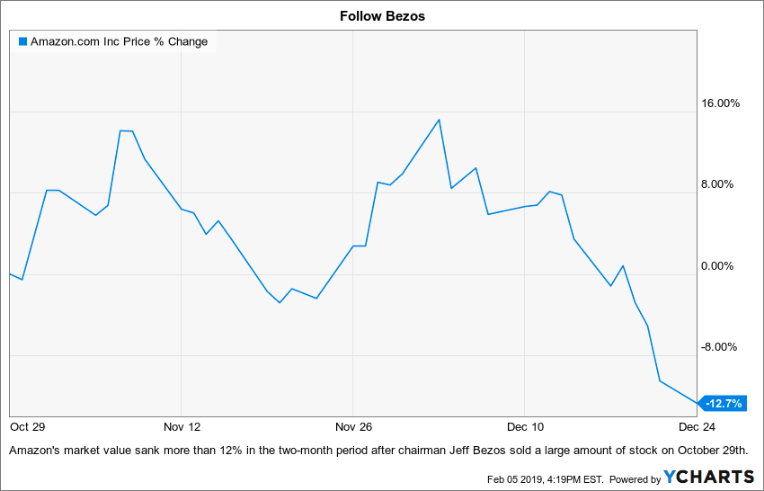 Suppose you were thinking about buying shares of Amazon (NASDAQ: AMZN) back in November. 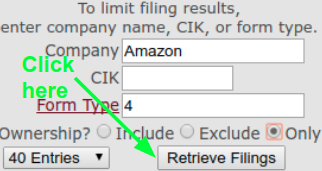 If you had looked at Jeff Bezos’s Form 4 filings on EDGAR, you might have reconsidered and saved yourself from some losses in the process. First, go to this page. You can also get there by googling “EDGAR most recent filings” (it should be the first thing to pop up that isn’t an ad) or by clicking on “Most Recent Filings” from the EDGAR main page. It should look something like the image below. And you’ll see why EDGAR users knew to avoid buying Amazon shares in November. Bezos sold a bunch of his own common stock in the company on October 29th. Sure enough, a couple months later, Amazon’s market value had fallen by more than 12%. EDGAR could have helped you get ahead of that downturn. This isn’t a perfect example, nor is it an exhaustive tutorial of everything EDGAR can do. But I hope this article has demystified the strange world of legal insider trading for you. Next time you’re doing your due diligence on a stock, pop into EDGAR, find the chairman and/or CEO’s Form 4 filings, and take a look at what they’ve done with their own company’s shares. If they’ve bought more, that’s a good sign. If they’ve been holding (which would likely be indicated by a lack of Form 4 filings), that’s also a pretty good sign. If they’ve sold shares, it might be worth doing a little more research. There might be a problem only the leadership knows about. But as a newly minted EDGAR user, you’ll always be ahead of the crowd.